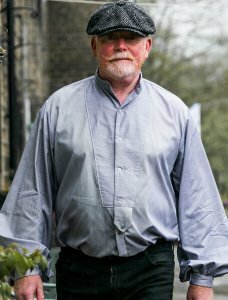 At Elgar Shirts we are enthusiasts about historic clothing. We love the natural fabrics and the pragmatic approach to the cut and construction. The styles of clothing worn by previous generations evoke the past for us; they are wearable history. 200 years ago shirts were largely made within the home by women from white or un-bleached linen. The cloth was cut into a simple set of rectangles and squares to maximise use of the expensive cloth. Only the collars and cuffs were made to fit the wearer, so the body and the sleeves were gathered up to fit onto the collar and cuffs, resulting in a full, loose-fitting shirt.They were made with a short front opening; just long enough to get on over the head, fastened at the neck and wrist by one or more buttons. 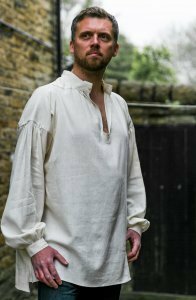 Men’s shirts were multi-purpose, worn both as underwear and as nightwear, so the shirt tails were long, mid-thigh or to the knee. Shirts were worn with a necktie, tied high around the neck, so only a little of the shirt front was visible. Few old shirts have survived, as old shirts would be worn by the servants or cut down for children. The cloth would subsequently be used for bandages – nothing was wasted. 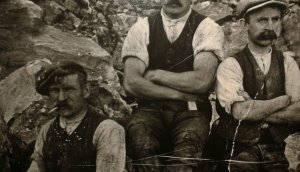 Working men’s shirts remained plain and utilitarian, and changed little over the centuries. Our cream linen mix shirt is a simple shirt of the type worn by working men. Gentlemen’s shirts were made from finer, whiter linens, trimmed with lace or flounces at the neck and wrist. They changed with the prevailing fashions. Our cotton damask shirtgives the feel of a gentleman’s shirt. From the mid 19th century fashionable men would wear stiff detachable collar and cuffs on their shirts. The collar was attached by 2 collar studs, through a buttonhole at the back of the collar and two buttonholes at the front. So shirts were made with just narrow neck and wrist bands. The bib front on a shirt provided an extra layer of warmth around the chest. Our bib-fronted 19th century shirt echoes this styling, including a trouser tab to secure the bottom of the bib to the trousers. 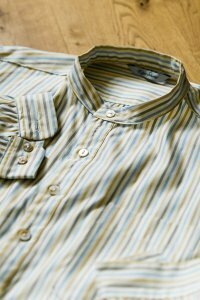 By the turn of the 20th century, factory-made shirts were available and there was a gradual changeover to shirts that buttoned all the way down the front – an easier style for mass production. Smartly dressed men continued to wear stiff, detachable collars on their shirts, to allow separate laundering and starching of the collar. 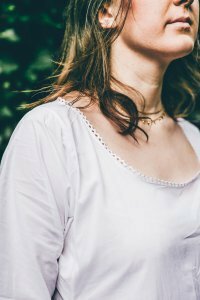 In the 1960 and 70s there was a revival in the collarless shirt, when it became popular for young people to buy old shirts from jumble sales and Oxfam shops term – the “grandad shirt” became fashionable. Our striped grandad shirt is based on the shirts worn the early 20th century, and echoes the shirts young men wore in the 1970s. Military clothing has always influenced fashion. The khaki jackets worn by British forces in 19th century India were supremely practical with their large buttoned-flap bellows pockets. The term khaki derives from a Hindustani word for soil; this yellow-brown drab colouring served as camouflage in desert conditions. This evolved into a jacket worn by turn of the century adventurers in the African bush as the bush jacket or safari jacket. The safari look was further popularised in the movies of the 1950s, where film stars added some glamour. 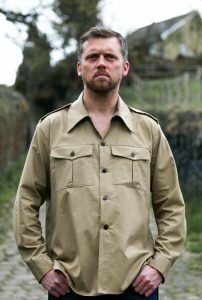 Our Safari shirt in khaki cotton twill gives this look, with buttoned shoulder straps, and flap pockets. It can be worn open over a T-shirt as a lightweight jacket. 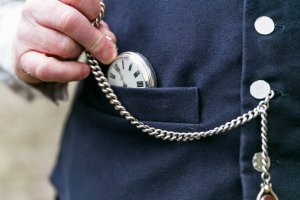 Waistcoats have been worn in the UK for some 350 years, since Charles II lead a move away from the French style of dress. They were originally a sleeveless version of a long jacket, a more relaxed style based on Persian clothing.The waistcoat, also known as a vest, was the centrepiece of a fashionable gentleman’s wardrobe in the 17th and 18th centuries and so was brightly coloured and elaborate. Waistcoats worn by the militia were made from old jackets turned inside out and remade into contrasting waistcoats. 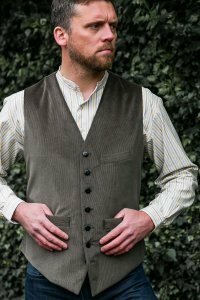 The wearing of waistcoats filters down through society, and by the mid-19th century most working men were wearing waistcoats usually made of fustian cloth such moleskin. In the 19th century waistcoats became more restrained, and evolved gradually into the 3-piece lounge suit of the 20th century. 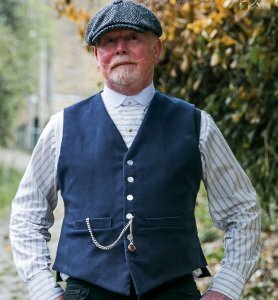 The coloured waistcoat continued to be worn in the country; a toning or contrasting waistcoat worn under a tweed suit for country sports such as hunting and shooting. In centuries past it was normal for men to wear their shirt to bed. 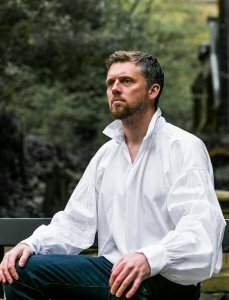 For the gentleman the nightshirt became another way to demonstrate wealth and privilege, so they became more ornate with embroidery and fancy collars. 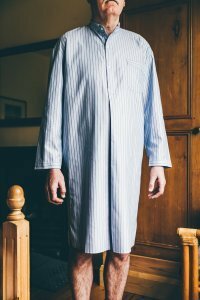 From 1870 pyjamas were introduced to the UK from India, and by the mid-20th century pyjamas had largely taken over from nightshirts. 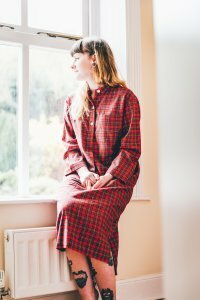 The nightshirts we sell, for both men and women, are a simple version of a 19th century man’s shirt, and provide a convenient and comfortable alternative to pyjamas. A chemise, also known as a shift or smock, was the only undergarment worn by women before the early 20th century other than a corset. It was usually the only item of clothing to be regularly washed. It was put on either over the head or by stepping into it, so it has no buttons. 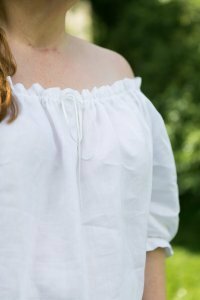 A chemise was made in the home from a single piece of linen, sometimes hand-woven, or cotton cloth. The fabric was cut into rectangles (for the main body), squares (for the sleeves and the underarm gussets) and triangles (as gores to give flare at the hem) then sewn by hand into a chemise. 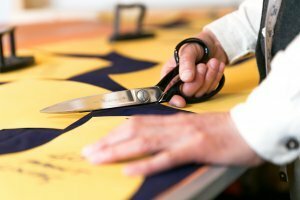 The cut was designed to make best use of the cloth. The quality of the garment varied according to the means of the household, so while most women wore skimpy chemises make from coarse linen, the better off wore fine, smooth linen embroidered and trimmed with lace. Elgar shirts make simple chemises in linen, cotton batiste and cotton muslin, loosely based on 18th century patterns. Robe is a general term for a loose-fitting garment, long, flowing, comfortable and versatile. It is worn by both men and women. In the 17th and 18th century European men’s fashions were influenced by Eastern and oriental clothing, and a garment called a banyan became popular. 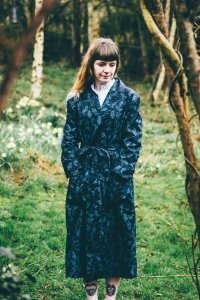 This was the precursor to the dressing gown, a long, informal coat worn about the house for relaxing, made from an exotic fabric such as silk or chintz. The movies of the 1920s and 1930s lent the dressing gown glamour and popular appeal for women as well as men.